It was a day of food tourism today. Started off with coffee and cake, at Drop Coffee Room, the coffee was single origin (!!) and we enthused over the aromas (after reading the posters on the wall telling us what to smell and taste). 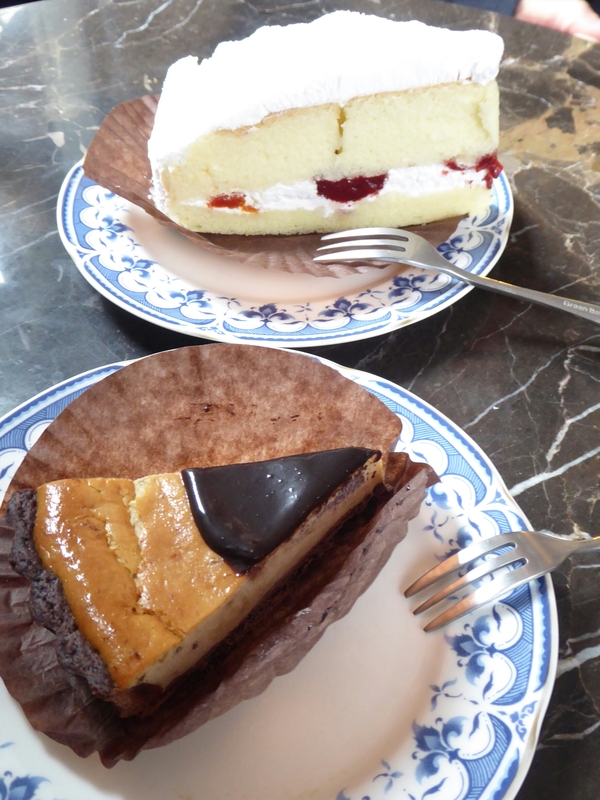 The cake was Boston cream pie and Banana chocolate cake, delicious start to the day. We then wandered around the university area, it was wall to wall cafes, restaurants and food stalls, each one looking and smelling better than the last. We were looking for the best Taiwanese pork bun stall, it was noticeable by the queue, we joined and asked for full fat bun. 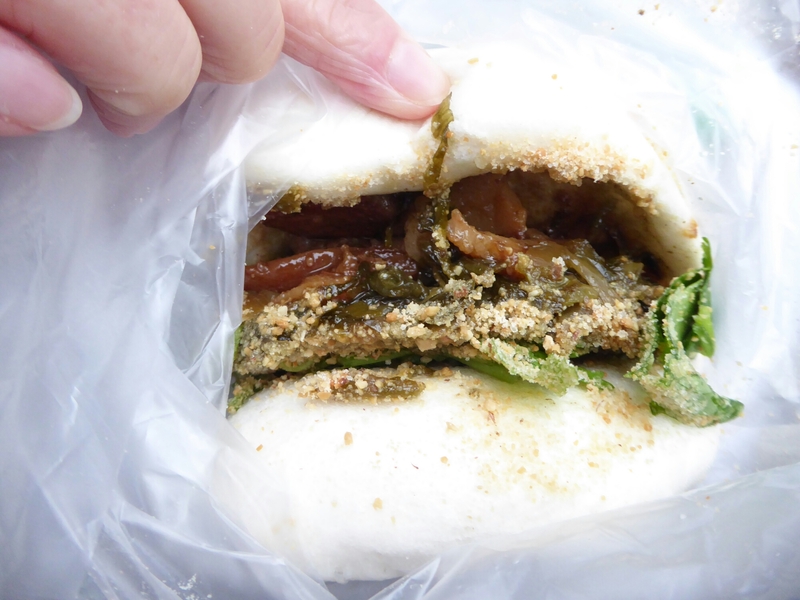 It was a steamed white bun filled with juicy pork fat, cooked till tender, with pickled greens and some sprinkle on top, maybe peanut? In the interest of balance, we also had a full meat bun, which was ok, but missing the fatty juiciness of the first bun. Falafel next, yes, falafel in Taipei, this city just gets better and better. It was delicious, tasting middle eastern, full of cumin, coriander and familiar spices. We were full now so needed to walk off our calories, through markets that were closing, down back streets and past an urban garden with shopping trollies full of plants and an old aunty watering the plot. 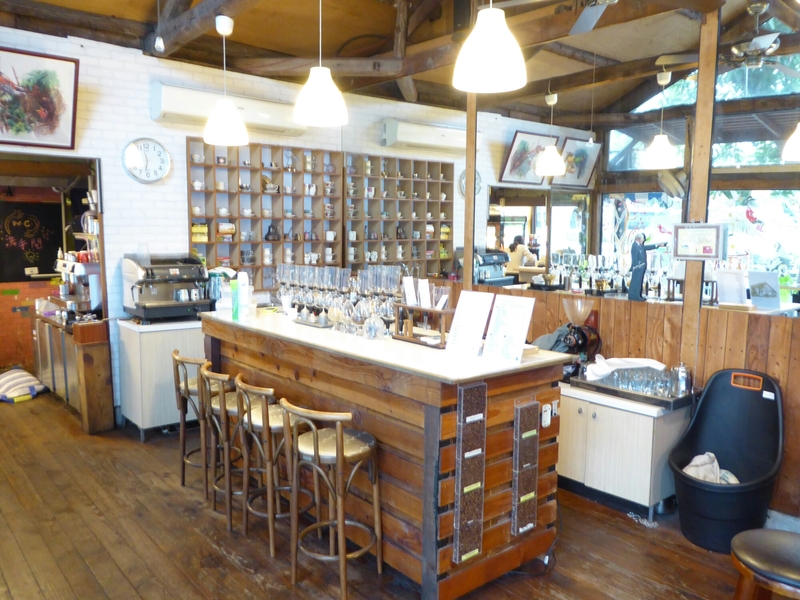 We came across the best cafe/bar in the world (according to Guy), Cafe Libero. It has an impressive selection of whisky, many Japanese, and the wooden panelled walls, comfy chairs, warm heating made it feel very much like home. 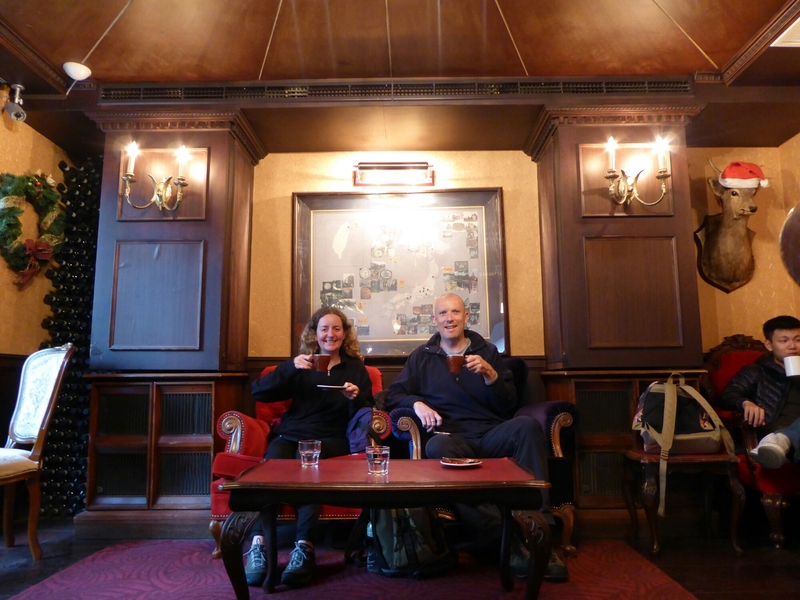 We treated ourselves to a hot chocolate with whisky, oh yes, it was the best ever. The music was bluesy, ambient and chilled, the guy then put on David Bowie. Life doesn’t get better than these moments, so we relaxed and had to remind ourselves we were in Asia when we emerged blinking into the sunlight. 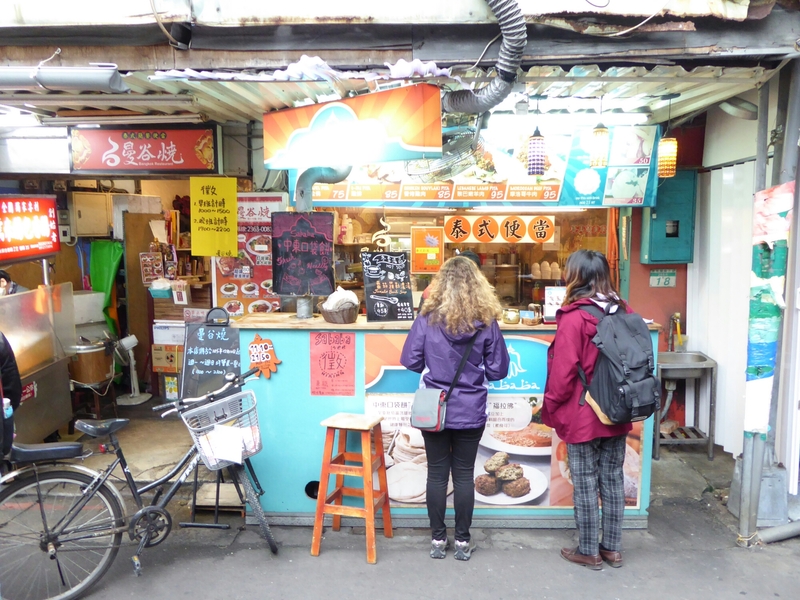 Next we were off to Mango King, a chain of shaved snowflake milk ice shops which the Taiwanese love. 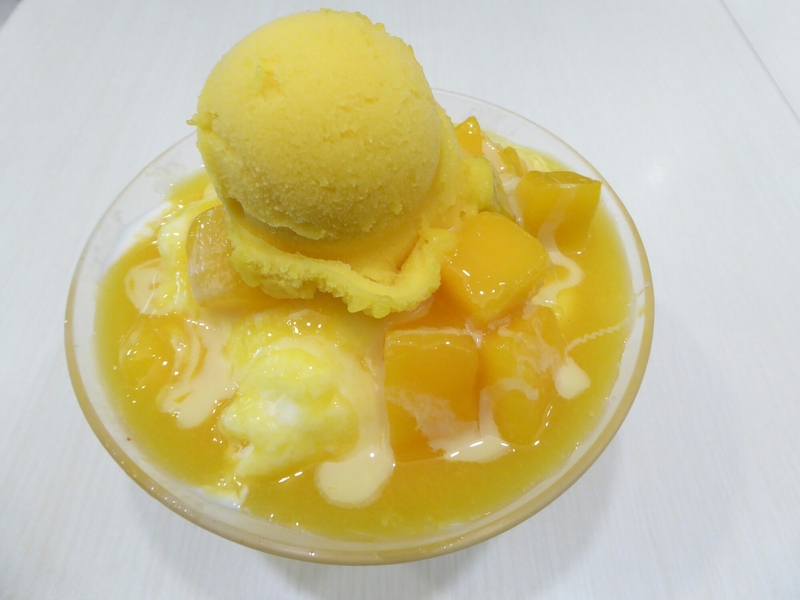 The portions are huge, we went for the smallest, a Mango Emporer, it was more than enough for us the mango was delicious, but I wasn’t keen on the shaved milk ice. Brains frozen we headed off to a german bakery, which was next on our food gourmet tour. 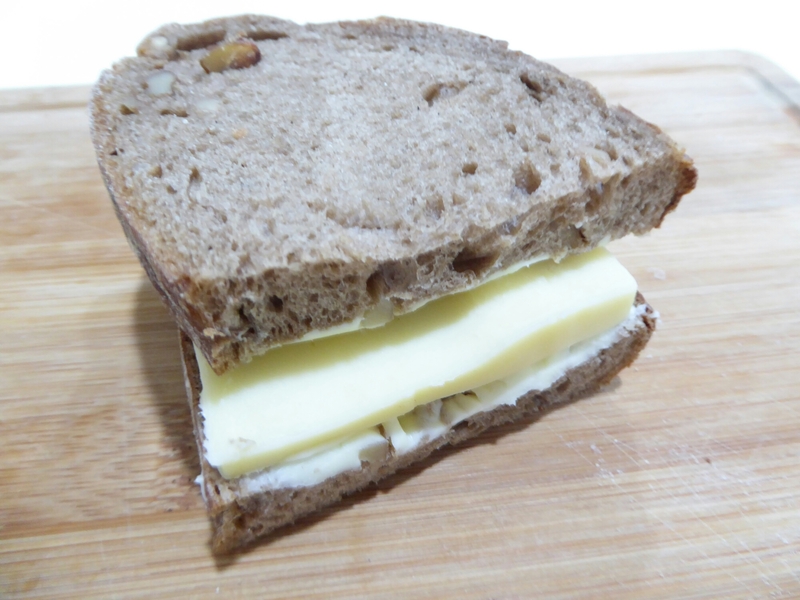 We chose the walnut rye bread and stopped at Sogo food court for a small, expensive block of cheddar to accompany our bread. The evening was spent writing postcards and eating cheese sandwiches.